A writer and researcher, he explains that hopeful people often demonstrate the following qualities. They believe that the future will be better than the present. They believe they have the power to make it so. Shane outlines this research in this video. He gives an excellent presentation, even though he has to do so while people in the audience are eating their lunch. Human beings constantly focus on the future, says Shane. Envisaging how the future can be, they set goals and have dreams. But what if they do not see a positive future? Shane explains that people can increase their sense of hope. “Future orientation relies on three kinds of thinking – goals thinking, pathways thinking, and agency thinking – and hope theory capitalizes on them. “Goals thinking is ubiquitous, and we all do it fairly well, but everybody could do a little bit better in refining goals to make them more attainable, to make them approachable. “Pathways thinking is the perceived ability to create pathways or strategies to get from point A, where you are now, to point B, which is goal attainment. “Agency thinking is the self-efficacy and the mental energy to work and pursue your identified goals along your selected pathways. Hope costs nothing – it does not relate to income. Hope is teachable – it is possible to teach people to be more hopeful. You can discover more about Shane’s work at his web site and also his blog for Psychology Today. Shane’s site also contains details of his latest book. Here is a description. 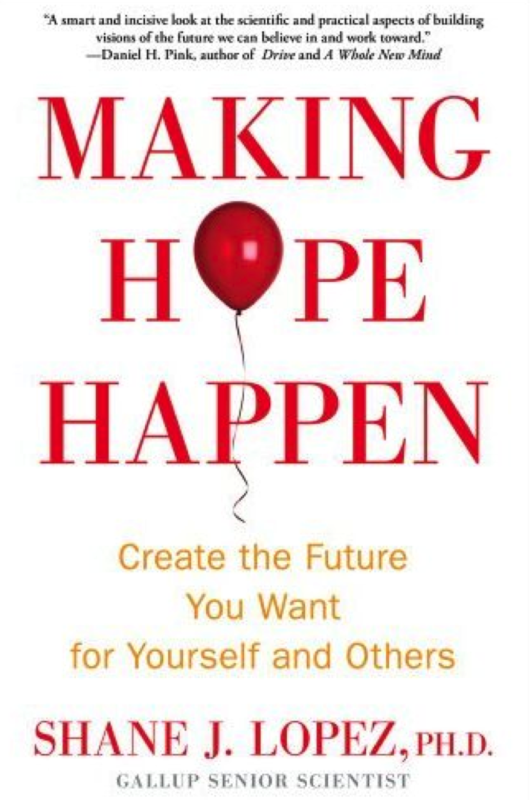 “Making Hope Happen is the first scientifically based blueprint for mobilizing the energy and power of hope in every area of an individual’s life. “It details proven strategies and techniques for building a high-hope mindset that is also effective for meeting short- and long-term goals. “Readers will take a hope quiz, learn to find where their best hope lies, and define what matters most to them in order to drive hope today and into the future. “The newest evolution of positive psychology, Making Hope Happen also tells the inspiring stories of real people – parents, educators, entrepreneurs, young and old people with health challenges, and civic leaders – who create hope and who transformed their own lives as well as their schools, workplaces, and communities.